When you stand on a scale, the scale’s reading is a measure of your weight. It is actually recording the Normal force the scale has to exert to support your weight. When you and the scale are stationary with respect to each other, these forces balance out and your weight is equal to the Normal force. What if you and your scale are in motion, like in an elevator? If the elevator is stopped, the scale reads what you would expect it to read, your weight in an elevator. The same is true when the elevator is moving at a constant velocity. There elevator is in equilibrium. You may notice that when the elevator begins to move, your weight seems to change. As the elevator begins to rise, you feel heavier. When the elevator descends, you feel lighter. Let’s see why this happens. First, let’s look at the forces in action as the elevator begins to move up. Let’s consider ‘up’ as the positive direction. When an elevator starts to accelerate upwards, you and your scale experience the same acceleration. The floor of the elevator pushes you and the scale upwards. This means the scale has to push on the person with an extra force to push you and your weight up too. The new Normal force is greater than just your weight alone. Let’s add up the forces acting on you. The overall acceleration is up, so the acceleration is positive. There are two forces in action, your weight down (-mg) and the supporting Normal force. The scale reads the Normal force, so it reports your weight as greater than it was at rest. The same two forces are at work as when the elevator was accelerating up. The scale will read the Normal force which is less than it was at rest. A 75 kg man stands on on a scale in an elevator. When the elevator begins to rise, the scale reads 100 kg. What was the acceleration in factors of g? Divide one equation into the other to find a ratio. 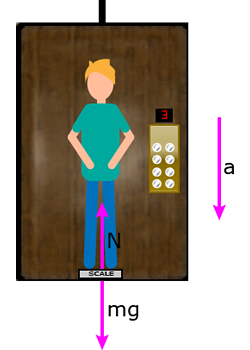 The acceleration of the elevator is one third of a gravity. Since the acceleration is positive, the direction is up.